Ever wonder where Spider-Man eats? Why at Hardees of course. The fast food chain known for its provocative commercials (as well as Carls Jr.) have joined forces with the fast-approaching web slinging reboot to introduce a new sandwich named after the crimefighter. 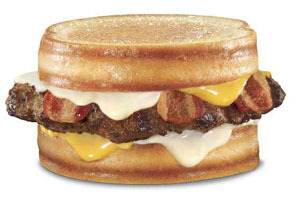 The Amazing Grilled Cheese Bacon Burger puts a spin on the classic sandwich, featuring a charbroiled beef patty topped with bacon, American cheese, Swiss cheese and mayonnaise, all on grilled bread. While it’s unlikely fans could eat too many and stay in Spidey-shape, the first advertisement for the sandwich is already available on the restaurants’ You Tube channels. It shows Spider-Man dropping in on a group of costumed fanboys waiting for the movie’s premiere and saving the day while eating his “amazing” burger. This isn’t the first time Hardees and Carls Jr. have teamed up with a Spider-Man franchise. In 2002, the fast food company created a product tie-in for the Sam Raimi-helmed Spider-Man.